Each day is like a century for the driver of the Phantom Carriage. Literally. For three-hundred and sixty-five of our days he travels the world, harvesting the souls of dead sinners, taking them to a place we never see, for reasons we’re never told. But whatever his purpose, the year he spends at his gruesome task is spent alone, and it amounts to 36,500 years of introspection. The Phantom Carriage enticed me with particulars like this; perhaps that’s part of its spell. Victor Sjöström’s film is otherwise all atmosphere: a moody morality play that hollows out space for its characters amid surroundings so black that you question what truly is the negative space. It’s not boring, but it is mannered and slow—I had time to wonder about the carriage rider’s job and the consequences of the math and had little trouble keeping up with the plot in the meantime. The plot is this: a rotten piece of dirt named David Holm (played by the director) is called to the deathbed of Salvation Army worker Sister Edit (Astrid Holm) on New Year’s Eve. Edit has devoted the last year of her life to reforming Holm, a violent drunk, who’d devoted much of his own time to tracking down his wife and children, who had quite reasonably abandoned him. He remained the same rotten piece of dirt after he found them. He also gave Sister Edit tuberculosis. She longs to see him one more time, and he says no. David does not deserve a happy new year. That same night, David tells his fellow good-for-nothings about a legend he’s heard, which goes like this: The last person to die on New Year’s Eve—the one who expires closest to the stroke of midnight, is cursed to become the driver of the Phantom Carriage for the entirety of the following year. David learned this tale from a friend name Georges (Tore Svennberg), who believed it wholeheartedly, and supposedly died exactly one year ago. In fact, Georges has spent the last 365 days (36,500 of his own years) as the Phantom Carriage driver, and when David is accidentally killed in a brawl moments later, he appears before his former drinking buddy, Jacob Marley-like, and fills in the blanks. Sjöström isn’t too creative with the look of his carriage driver: Svennberg is garbed in a black cloak and hood, carrying a scythe; he rides a ramshackle cart pulled by one horse (lanky, but not skeletal). However, the major technical achievement here is to make the whole package transparent, and it is well done. 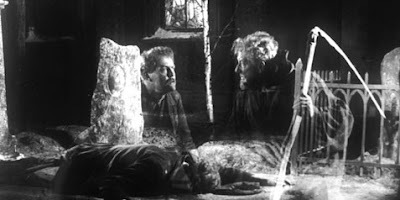 Svennberg passes through doors like a convincing ghost; in one early scene he scoops the soul-body of a fallen suicide up from his physical one in a seamless motion that no one could do any better today. 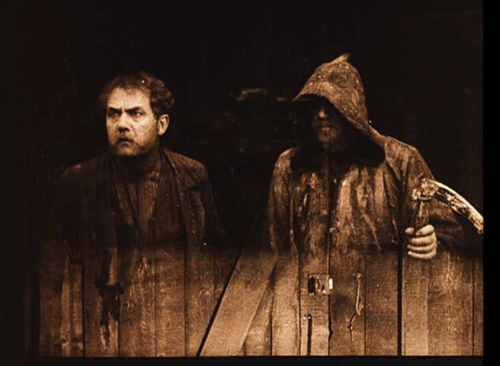 Even more unnerving is his retrieval of a drowned sailor’s soul, because the effect of the carriage on the ocean waves is not convincing—the carriage seems to ride against the waves, rather than over or through them, making it seem otherworldly by distancing it from the reality of the film itself. Georges, with his centuries of time to think, has become a somber, sober truthsayer. His heart-to-heart talks—first with David, then with Edit, turn The Phantom Carriage into a succession of extended flashbacks. I admit I was disappointed by this. I wanted more about the carriage itself, and the details of drivership. Where does the driver take the souls? If the driver only harvests the souls of the wicked (as is implied), who does he really work for? Is next year’s driver simply the last man to die on New Year’s Eve, or the last wicked man? If the latter, is the role akin to purgatory? If so, what happens to him when purgatory ends? Alas, Georges’ last night of work (and apparently, David’s first), occupies only a narrow sliver of the present in Sjöström’s film, being little more than a vehicle through which to recount David’s dissipated life. The Phantom Carriage is a plain tale of a sinner’s redemption, classic in every sense but one: the overwhelming scumminess of its sinner. At least Faust was an educated man gone bad; at least Scrooge had a head for business. David Holm? He’s a consumptive slime who can’t even be bothered to cough sideways in front of his kids. His life-story is one of steep and rapid decline, barely slowed by Sister Edit and her hopeless acts of charity. Do I recommend this film to you or not? The Phantom Carriage is well-loved, but I suspect most people love it for the same scenes I loved, which make up little of the whole. Not that the rest is bad, but if the theme of the film is reliving the moments that count, well, I can do that too, and there aren’t that many. Ask me in a year’s time if I remember Sister Edit’s benevolent coat-mending as well as I do the carriage driver… pressing his two-dimensional, transparent horse onward against a three-dimensional sea. I can predict my answer. The coat is pathos, but that scene in the water? It has everything. 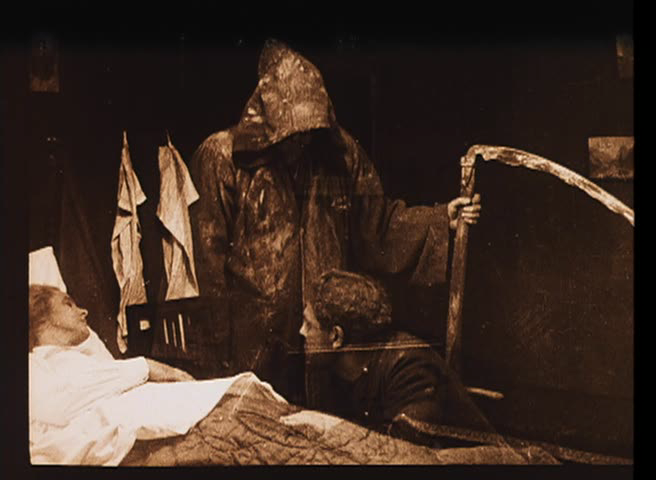 My thanks to Allen Shugar, who was generous enough to lend me a videotape of The Phantom Carriage, and patient enough to wait the many months it took me to watch it. I look forward to reading your thoughts on the film, Jen. It's maybe a bit overrated, but worth watching for sure. You are definitely right that the scenes with the carriage are the best, and there should have been more of them. However, I have to disagree that David Holm's scumminess hurts this movie. I think it helps. Too often the "flawed" protagonists in film are barely flawed at all. The look great and are charming and generally good people, just maybe with a bit of a drinking problem or a temper. Here, the fact that Holm has fallen so low makes his redemption more meaningful. Plus some of the best acting in the film comes from Holm's wife reacting to his cruelty or from Holm himself acting crazy. Yes, the story is moralistic and melodramatic, but as a lover of silent film I'm sure you see a lot of that. In silent film they're typically nothing *but* the flaw, but I see your point. Excellent points. But remember, this movie and the novel it is based on has overtly Christian sensibilities. Because of this, it is more poignant for the film to show a real scumbag (and though hes a stereotype, there are plenty who are as scummy as him that are just too unglamorous to be in films as anything but a full villain) finding redemption, because that shows the incredible power of Christ as a redeemer, or something like that. On a side note, just curious as to what you think about the director Guy Maddin. I haven't seen enough of Maddin's work to form an opinion. I disliked The Saddest Music in the World, but not on aesthetic grounds--it was simply obnoxious. Others find it brilliant. I do know that he divides the silent film fan community. On one hand, they applaud him for his clear love of the films; on the other hand, they accuse him of perpetuating the myth that silent films are hysterical and terribly preserved. I will likely review The Heart of the World, some day. I recall enjoying that one. Have you seen Twilight of the Ice Nymphs? I hear it is one of his worse ones. This is a link to a (imo) hilarious review of the film by a guy who reviews a lot of High Brow crazy films. Its worth checking out for a laugh. Nice review. Some of the questions you adress with what happens in the afterlife etc. I wished they would have done a sequel/prequel about. I like to think of "Phantom Carriage" as "It's a wonderful Life" as written by Franz Kalfka. Glad to find the Criterion print on Hulu. Watched it tonight, based on your review. Beautiful, haunting film. I particularly enjoyed how the storyline looped back on itself with narrations inside of flashbacks inside of other narrations. Somewhat dissatisfied with the ending, though. Who ended up taking over the carriage, do you suppose? (and yeah, I wanted to know more about how it all worked -- did he just take sinners?) Thanks again for the review. Thank you for sharing your thoughts. This is a movie that provokes thoughts. Are they just the wicked people? Where does he take them? Why is this so slow? Good review.